The atmosphere at Little Chem Chem is welcoming, elegant and oozing authenticity of a bygone era. The luxury of sharing 16’000ha with only 10 guests sets the ideal stage where one can perfectly blend into the wilderness. 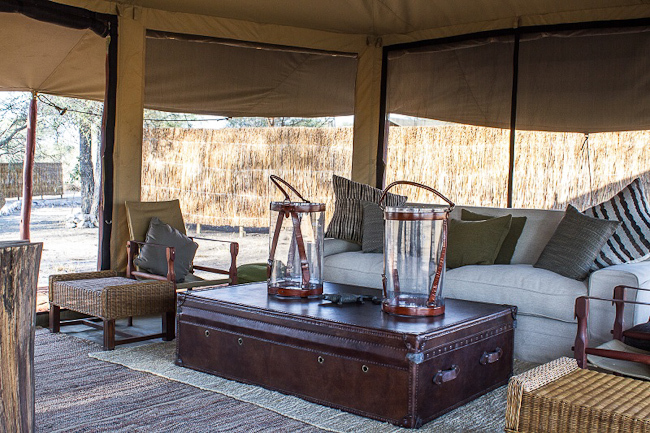 Lions roam around the camp and call each other at night; stately elephants march down to Lake Burunge to get a sprinkling of fresh water; cheetahs hunt on the plains facing the lake; leopards, eland and lesser kudu can be seen in the more dense woods in the inner part of the concession. And wherever there is water, the bird life is abundant and colourful. Little Chem Chem is the ultimate setting from which to explore on foot, slow down and indulge in a sensual African safari. Little Chem Chem is closed between the 1st April and 14th May each year, as the rains are heavy at this time. Set on the earth, the five vintage tents have a large bedroom with rocking chair and study desk, a vanity area with dressing room and an en suite baothroom with bucket shower and flushing toilet. Chem Chem cares passionately about Tanzania's economic and social development and is proud to contribute to local community development efforts through their LIVEWILDLIFE foundation. LIVEWILDLIFE's aim is environmental protection in rural Tanzania by assisting the communities in their present efforts to safeguard their surrounding wildlife and in the long run supporting the education system in cooperation with the local people, the teachers and state officials. In consultation with the appropriate authorities, LIVEWILDLIFE supports the state school infrastructure, offers courses for teachers and helps children to learn more about their local ecosystem through environmental education. LIVEWILDLIFE believes supporting education and protecting wildlife forms a perfect symbiosis, where Tanzanians determine their own land use, while the local ecosystem with its unique biodiversity stays in balance. LIVEWILDLIFE devote their work to the communities, especially to their children, towards a sustainable future. They also support the rangers employed by Chem Chem who protect the wildlife of the concession. 2013 Wildlife Corridor Project: Chem Chem are currently working with the Wildlife Management Area to rescue to last wildlife corridor between Tarangire National Park and Manyara National Park. This is a hugely important project with the ever increasing influence of human impact on the natural movement of wildlife in the area. It involves working closely with and providing work for the villagers in the corridor, encouraging employment for women, game warden training etc to ensure successful delivery of the project. The Dry season is between June and October when it is an excellent time to watch animals gathering at waterholes and rivers on the search for water. The Green season is between December and March when there is a little rain, a fantastic time to see wildebeest and zebras calving as well as for bird watchers to see the millions of flamingos that migrate to Lake Manyara at this time of year.